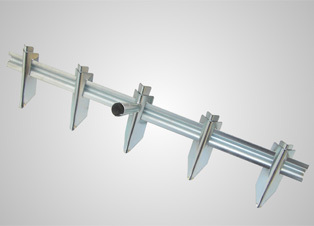 The row marker is used to make grooves for sowing or planting in line. The use of a string for marking a straight line is no longer necessary. For easy and efficient hoeing with the wheel hoe it is essential to plant or sow in a straight line. With the 5 adjustable markers it is possible to mark any row distance. No additional tool is necessary to adjust the distance between the markers.